When the weather starts to warm up, our thoughts turn to summer fun: long warm days filled with adventure or simply enjoying the outdoors with the people we care about. And what’s more enjoyable than firing up the grill with family and friends? Having a dedicated area to use for food prep, additional space for dishes and condiments, or to display all that delicious food is especially useful this time of year. After a thorough review of the market, we have found that the Great Deal Furniture Bennet outdoor trolly cart is the best outdoor prep station serving cart around. It looks beautiful and is quite flexible, and can be used in a wide variety of ways. However, it is perhaps marginally more focused around serving food and drinks, rather than cooking food, which may be a negative for some. 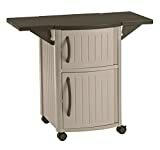 This is one of the most versatile carts we reviewed, whether you need a prep area near the grill, a food service station, or even a cart for all your gardening supplies, the Keter Unity Indoor/Outdoor BBQ Entertainment Storage Table/Prep Station with Metal Top fits the bill, making it our Runner Up Best Outdoor Prep Station. It’s well constructed, attractive to look at, has tons of storage and prep space, and comes with a stainless-steel top for easy clean-up. If you’re looking for a cart that is more focused around food prep, the Unity is a fantastic choice. 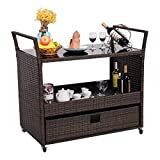 For those of you watching your nickels and dimes, the Giantex Rolling Portable Rattan Wicker Kitchen Trolley Cart Dining Restaurant with shelves is our best budget pick due to its very reasonable price and sturdy construction. This dark brown rattan wicker cart will make a functional, yet beautiful, addition to those warm summer gatherings. For more information on the Giantex Rolling Patio Cart, please see below. Today we’re reviewing five different outdoor prep stations, from serving carts to dedicated food prep areas, in order to showcase some of the best options available for adding outdoor “kitchen” space. Out of those five we review, we’ll pick a top choice, best runner up and best budget choice to help you with your decision. Before you know it, you will be enjoying summer entertaining with your new prep station! You may also find our information on rolling patio coolers useful as well. The Keter Unity indoor outdoor prep station is an incredibly useful, versatile outdoor preparation and utility cart. Available in two sizes, the small (shown here) and the XL, these carts are fantastically useful work and display stations. The Keter Unity XL cart was one of our Outdoor Kitchen Essentials! The Keter Unity bar cart prep station is a versatile, functional, and attractive addition to any backyard kitchen. It is super useful and won’t break the bank, making it our Runner Up Choice. The Unity has a large lockable storage cabinet (capable of holding a propane tank), a stainless-steel counter made from 430-grade stainless steel, and plenty of other handy storage solutions such as hooks for hanging utensils. It also has an extra side bar that can be used with paper towels or a cloth towel, and a bin for spices or other small items. It even comes with a bottle opener! The Unity, and its big brother the XL are made from sturdy plastic resin that has the look of real wood, but none of the care and maintenance associated with wood. These babies are built for the outdoors! You can even use this as a garden cart if that fits your needs! This cart will take some time to put together, so don’t get in a hurry—you’ll have plenty of time left to enjoy summer entertaining. One tip: get every bolt “half” tightened, and then go back and do a second round and tighten everything securely. This way, you can ensure all of your holes line up properly, and you won’t have any headaches. You’re sure to love the adjustable feet that make leveling a breeze, and the two wheels on the opposite side allow you to easily move the cart where needed. Compared to some of the other carts reviewed here, this is more of a traditional barbeque area prep station than food or bar service cart. 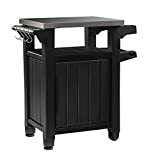 If you want a sturdy, functional, and reasonably priced outdoor food prep station to expand your barbeque work area, the Keter Unity storage table/prep station could be a great choice for your summer entertaining. It’s super versatile, though perhaps primarily focused around food preparation rather than display and storage, and is a great addition to any outdoor kitchen space. And, it’s so versatile you can even use it as a garden cart or potting bench! The Suncast DCP2000 outdoor prep station is made with the same sort of frame material as the Keter Unity, but has a much lower quality fit and finish. It is, however, a pretty useful outdoor prep station, and the fold up tray is a nice design that works well to balance space constraints and workspace. The Suncraft DCP2000 has an attractive space-saving design that would work well to extend your outdoor prep area. The drop-down side extensions are a really nice feature, as well as the four large wheels that enable users to easily move the cart where needed. The extra serving tray is a nice little bonus for storing small items or to use for carrying things from the grill area to the table. The DCP2000 is constructed of molded resin plastic, which is quite robust and can survive pretty harsh conditions. One word of caution: leaving it out in the direct sun for an extended period of time it could cause the cart to warp, so store it out of the sun, or throw a cover over it when not in use. This prep station is easier to assemble than the Keter, and doesn’t require any tools—it just snaps together. Unfortunately, this is where a few problems were identified as several customers reported that the molded plastic pieces arrived warped, making assembly very difficult and in some cases, impossible. If this should happen, the company will gladly replace the damaged piece, but it’s noteworthy just the same. A good functional outdoor prep station for the money with several nice features such as large casters for easy mobility, the fold down extensions to add more counter space, and two separate enclosed storage areas. The finish feels significantly lower quality than the Keter Unity, given similar materials, and it feels like less thought went into the design of this cart, compared to the Unity. We do like the fold-out top, though! The Giantex Rolling Patio Kitchen Trolley Cart features a stylish resin wicker weave, wrapped around a sturdy steel frame. It offers a large lower drawer for utensil, cutlery, and other miscellaneous storage, and is certain to look fanatic as a display place for your outdoor meal, as a serving cart, or as a prep station for cooking. The Giantex Rolling Portable Rattan Wicker Kitchen Trolley Cart is perfect for entertaining, or for providing additional prep space for those backyard gatherings. This useful, stylish, and beautiful cart has a very attractive price tag as well, making it our Best Budget Choice! The two large shelves provide ample food prep and serving space, and and the pull-out drawer on the bottom as helpful for providing ample storage as well. You’ll have no problem moving the Gianetx from one location to another, as this cart is set up withs four easy rolling casters and two large handles, one on each side. Want the cart to stay put? No problem! The wheels lock when you need it to be stationary. You’re sure to receive multiple compliments on the look of the rattan wicker design, with its warm brown tones, and the lovely tempered glass top works well for displaying or preparing food (though you should use a separate cutting board if you intend to use it for food prep. Luckily, you don’t have to sacrifice durability as it has a sturdy steel frame. Additionally, the Giantex is also fairly easy to assemble, and it comes with simple instructions that will have your cart ready for entertaining in no time. The design of this cart makes it perfect for serving food or displaying appetizers, with plenty of room for plates, napkins or drinks. Or if you prefer, it would work very nicely as a prep station as well. The Giantex cart comes at a great price, is attractive, durable, and offers plenty of storage. Whether you want to have a beautiful cart to display food and drinks for your guests or need additional prep space, this cart will do the job. There’s no problem moving it from one place to the other, due to the two large handles and quality casters, making it a great choice for summertime festivities. 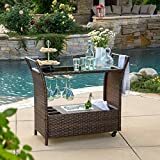 The Great Deal Furniture Bennett Wicker Serving Bar and Prep Cart is a beautiful, super useful outdoor prep and serving station that takes the design of the Giantex cart and amps it up a bit. With a built-in ice bucket on the lower tier, wine glass storage, and a large tempered glass top for display or preparation, this cart will dazzle with style, and make food prep and display a breeze. The Great Deal Furniture line of bar cart prep stations are by far the most popular of all the carts we have reviewed today, based on Amazon reviews. They are extremely well regarded, and their flexibility and utility make them our top choice. You can do whatever you want with this handy and beautiful cart—use it as a bar cart or food station for parties, or use it for additional prep space for cooking. It’s not only functional and beautiful but sturdy as well! The Great Deal Furniture line of carts are made out of high quality PE resin wicker, wrapped around a metal frame. It has two easy rolling wheels on one side and two stable feet on the other. Simply lift one end to move from one place to another. The Benett serving bar cart also comes with two large handles to make light work of moving it around. 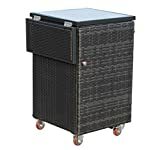 As with the Giantex Rolling Portable Rattan Wicker Kitchen Trolley Cart above, the design is likely better suited for displaying food and drink than a workstation. But don’t let that stop you—its tempered glass top would work nicely for food prep as well, though you’ll want a cutting board on top. The ice bucket is a nice feature, although it’s not removable. And, who wouldn’t love a rack for hanging wine glasses? To top things off, it’s a cinch to put together, having you ready for your backyard party in no time. The Great Deal Furniture Bennet Trolly Cart and Prep Station is a beautiful, supremely useful, and stylish outdoor display and prep station. The PE Wicker Weave is stylish, and the cart is easy to move and use. If you’re looking for a cart primarily focused on food and drink display, this cart is ideal. It can be used for prep, though it’s more ideally suited for setup and serving. It’s easy to assemble, well-built and durable, providing years of summer entertaining fun. The Outsunny 35″ Rolling Kitchen Trolly Cart bridges the designs of the more serving focused wicker carts and the more preparation-focused resin panel carts. This unit has a fold down side table, as well as a central tempered glass top. It also offers a cabinet storage area like the Keter Unity and Suncast DCP2000, with plenty of inside storage including a hanging basket! The tempered glass top still pushes this cart a bit more in the serving side of things than on the prep side of things, but it can be used for either. The Outsunny 35″ cart works well for those with small areas, who want to provide additional prep or serving space. The cabinet and the pull-out basket are a nice features, as is the handy attached towel bar. The Outsunny made from attractive rattan wicker and had a nice tempered glass top with sizable storage below. The wheels on this cart are quite large, making quite stable and easy to move around. When you want the cart to be stationary, they lock for added security. This cart isn’t hard to assemble and comes at a good price. The main downside to this cart is the fold-down shelf — it doesn’t work as well as it should. The shelf isn’t flush when extended, and several people had trouble getting it to stay either up or down. It’s also made of woven wicker, which is not really an ideal surface for putting much of anything small on top of! The Outsunny 35″ trolley cart is a nice cart for the money. The compact and well-built rattan wicker design is functional and easy on the eyes. The casters are high quality, and the inside storage cabinet with an extra hanging basket for small utensils and such, as well as an extra removable basket, is all great. The side shelf is not ideal, and hopefully, it will be redesigned to be more useful in the future. After looking at five outdoor prep stations, the chosen trolly carts have split into two general camps: those primarily focused on food preparation, and those primarily focused on serving. Of course, each can be used for the other task, but the different carts lean in one of those two directions. If you’re looking primarily for food display and serving capabilities, the Great Deal Furniture Bennet Trolly Cart is an outstanding choice. It’s highly functional, stylish, and useful. If you’re in need of a more cooking focused station, the Keter Unity line of carts is where you should head. These carts are really well designed and built and are an ideal choice.